In 2016, Section XXII struck for three months against the campaign by the Mexican government to impose a union-busting, privatizing education “reform.” Teachers, students, parents and indigenous communities barricaded highways at three dozen points across the state of Oaxaca for weeks, effectively cutting ground communications with the rest of Mexico. In a desperate effort to reestablish its presence, the Mexican government dispatched thousands of federal police. On June 19 the repressive forces carried out a massacre in the town of Nochixtlán, Oaxaca killing 10 protesters and wounding over 100. Despite this bloodbath, strikers continued that day to courageously resist the federal forces with rocks and flaming barricades in every town along the highway to the state capital. The strike lasted for two more months, ending (for now) in a standoff. The struggle continues. A translation of the statement by Section XXII in support of the strike by student assistants in Berlin follows. We have learned of your struggle for better wages and working conditions and the concerted efforts of the university bosses to downplay the struggle for your demands and to declare your strike illegal. We have also learned that a campaign of repression has begun with the deployment of riot police and private security forces to bar unionists from raising their demands at the “Queen’s Lecture” at the Technical University. Therefore, as teachers in Oaxaca and members of Section XXII of the National Coordinating Committee of Education Workers (CNTE), who have waged intense struggles against the privatization of education and campaigns of repression in which we have faced thousands of police and soldiers deployed to break our strikes, we say to you that in your arduous defense of your rights: Do not be intimidated! Continue your just struggle! It is outrageous that the wages of student assistants have not been increased in 17 years, while costs of living have skyrocketed. The denial of equal vacation time and holiday benefits is designed to drive a wedge between you and your non-student colleagues. Without a doubt, the bosses have perfected the art of dividing the social, union and student forces in order to rule, and to silence the liberating voices of progress. Therefore we the unionized workers have to perfect the art of unity in confronting the laws and impositions of the misrulers (Unrechtsstaat). 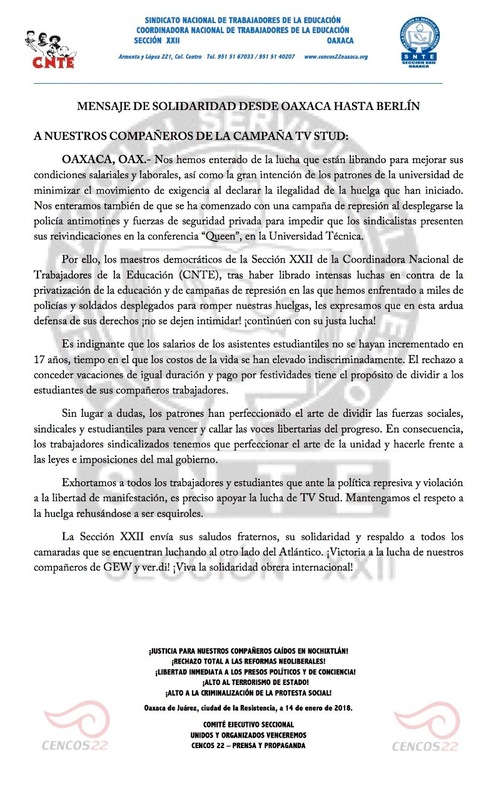 We appeal to all workers and students: in the face of the policy of repression and violation of the right to demonstrate, it is necessary to support the struggle of TV Stud. Respect the strike! Refuse to scab! Section 22 sends its fraternal greetings, its solidarity and support to all those comrades in struggle on the other side of the Atlantic. Victory to our colleagues of GEW and ver.di! Long live international workers solidarity! Dieser Eintrag wurde veröffentlicht in Arbeitskampf, Auseinandersetzung, GEW, Soli an uns, ver.di. Lesezeichen auf den Permanentlink. ← Eilmeldung: HWR versteht nicht was “Streik” bedeutet und ordnet Nacharbeit an.